Finding the time to cook and eat well is a challenge. It can feel expensive and overwhelming. Meal planning is an excellent way to include new recipes and foods into your life. Here are simple, healthy recipes I’ve used for years that are delicious and easy to make. Food as medicine! Congee is also a very easy, nourishing food for those who are sick, recovering from surgery, have just given birth or are breastfeeding. Cook the rice and water in a covered pot on warm for 4-6 hours or put it in a slow cooker overnight and wake up to hot breakfast. You can mix and match ingredients from the following list to make your own congee recipe. I’m emphasizing the foods that tonify the metal element, the Lung and Large Intestines, and help the immune system fight off pathogens in the transitional autumn season. Consider a breakfast congee of pears, ginger and almonds to moisten the lungs and intestines, warm the digestion and treat dry coughing. Or a Chicken, asparagus, and turnip congee to sooth cough, transform phlegm and fortify the lung qi. You may be realizing by now that any combination of foods can be added to congee to make it delicious and fortifying. Use your intuition when adding ingredients, cook what sounds good to your system. While we may think of the brain as the director of our lives, in Chinese medicine the heart is considered the benevolent leader, the true self, and it houses the shen, or spirit. The first acupuncture point on the heart channel is located deep in the armpit and the channel then traces the inner line of the arm down from the armpit to the tip of the pinky finger. In honor of the heart channel and the hot months of summer, this recipe is not to be eaten! It is a recipe for deodorant you can make yourself and scent with any essential oils you like. I swear by this deodorant, it works better than any natural deodorant I’ve ever purchased! Add coconut oil to a glass jar and set the jar in a pan of water on low heat. When the oil melts completely, mix in arrowroot power and baking soda. Add essential oils and stir thoroughly. You can keep the deodorant in a jar and spoon it out or you can pour it into an old deodorant container and put it in the fridge to harden. Beets are wonderful for strengthening the Heart and the blood. They can even sedate the emotions of fire out of balance like anxiety, nervousness and agitation. They are literally grounding. Beets improve circulation, purify the blood, benefit the liver and relieve fluid-deficient constipation and vascular congestion. With carrots, they can regulate hormones during menopause. This recipe is very simple and delicious. It can be varied in many ways, and if your body does not tolerate raw vegetables (which I really only advocate eating in the warm seasons), it can be cooked instead. You can add: garlic, fresh herbs, lemon juice, cayenne or anything else your heart desires. Stir the dressing in well with the grated vegetables and let sit. I find the longer the dressing absorbs into the salad, the better it tastes and the easier it is to digest. If you want to turn this salad into a healthy slaw, add mayonnaise (ideally made with olive, coconut or avocado oil. In fact, you can make it yourself with a simple recipe like this. This simple recipe is a tonic that embodies the sour flavor of the wood element. Lemon water has a number of health benefits and contains only two ingredients, good quality water and the juice from fresh squeezed lemons. Starting the day with a pint of room temperature or warm water and half a lemon’s worth of juice is a simple ritual that can improve health and appease the Liver to avoid spring’s physical and emotional symptoms. Give you energy: Because lemons contain negatively charged ions they create energy when they enter the digestive system. Some people find it a good substitute for coffee. Up to 70% of daytime fatigue is associated with dehydration so both of these ingredients will benefit mood and energy. Gomasio is a perfect winter food because it contains two ingredients that resonate very much with the Water element and the Kidneys. And those are the only ingredients! This light, flavorful condiment that originated in Japan is its own little Chinese herbal formula, as both seaweed and sesame seeds are found in the Chinese Material Medica. It is a lovely way to tonify the Kidneys during the cold winter months. Seaweed is high in mineral content and has a salty flavor. Salty is the flavor associated with the water element, winter and the Kidneys and Bladder. Sesame seeds, especially black sesame seeds are a kidney, blood and yin tonic. Sprinkle gomasio over soups, salads, rice or vegetable dishes for a subtle nutty, salty flavor. For wakame: roast in the oven at 350 degrees for 10-15 minutes. You will know it’s done when the seaweed is dark and crispy. For dulse: dry roast in a stove-top skillet until crispy. Grind seaweed to a powder with mortar and pestle. Dry roast sesame seeds in a stove-top skillet on low to medium heat, stirring gently until the seeds begin to pop and give off a nutty aroma. Add sesame seeds to the seaweed powder and grind until seeds are mostly crushed. You can store gomasio in a tightly sealed jar and it will last a long time, or keep it in a bowl on the table to add to your meals. This is a simple alternative to carbohydrate-heavy grain cereals. 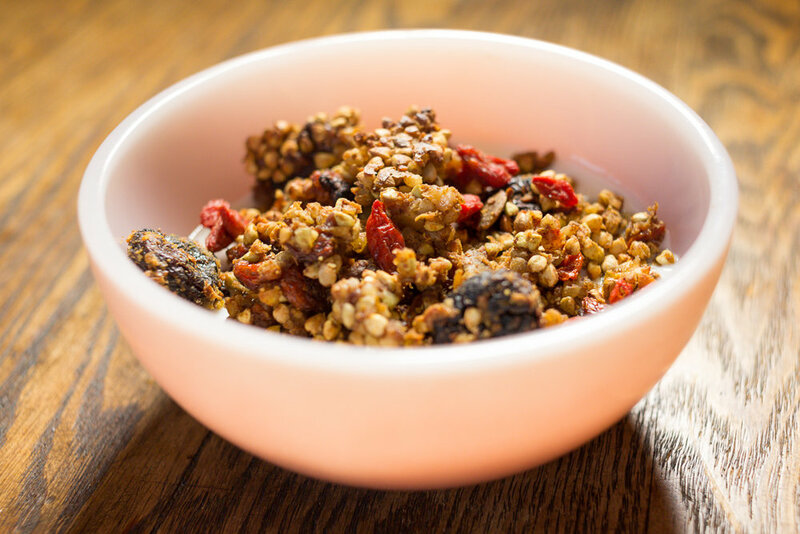 Buckwheat, hemp and chia are all seeds, which provide much-needed morning protein without the heaviness and fatigue that can come on after a breakfast of oat, corn, or wheat cereals. Combine ¼ cup chia seeds, ¼ cup hemp seeds and ½ cup buckwheat. Soak the seeds in water overnight. Rinse the seeds in the morning and combine with 2-4 cups of water, depending on how thick you like your cereal. Simmer on the stove for 20-30 minutes. You can add fruit, nuts, cinnamon, ginger, sweet potato, almond milk, honey, or you can make it a savory cereal and add miso and veggies or meat. Experiment and enjoy! Bone broth is a highly nourishing, protein and mineral rich food, excellent for building bone strength and intestinal health and rebuilding the gut lining. It is a great staple to have in the fridge or freezer for easy meals. You can sip on the broth by itself or add ingredients to make a quick soup. You can use the broth instead of water for steaming and boiling other foods (adds great flavor and nutrient value). Soup bones can be purchased from most butcheries and grocery stores and are reasonably affordable as one bone can make several gallons of broth. The marrow bones are best, where the bone has been cut so you have access to the inside of the bone. Any bones will work. Suggestions are: buffalo, beef, chicken, lamb, turkey, pork. You can crack poultry bones with a hammer before boiling to get to the marrow. Put bones and joints (they can contain meat as well) into a large pot or slow cooker. Fill with water and add salt to taste. Cook on low for 3-24 hours. The longer you cook the bones, the more they will yield. Adding a couple tablespoons of apple cider vinegar to the water and soaking the bones for 30 minutes before turning on the heat will help extract minerals. Add peppercorns and vegetables to the broth if you wish. Store in the fridge and/or freezer. To use medicinally for healing of the gut lining, to rebuild resources postpartum, or to help with bone growth, reheat 1-2 cups and drink with every meal. A simple, easy, and delicious breakfast or snack. Stir the ingredients into a batter. Heat a skillet on the stove and add butter, ghee or olive/coconut/sesame oil. When the skillet is hot, fry up the batter like pancakes. You can top them with butter, maple syrup, jam, yogurt or eat them plain! Everything we put in our bodies is medicine. Everything we tell ourselves is medicine. How to eat, when to eat, how to prepare food and how to balance the energetics of food are just as important as what we eat and is based on each person’s constitution and present health. Education and discussion around foods, trusting one’s own body over health fads and bringing awareness to our eating habits is significant to leading a healthy, long life. During appointments, Gillian provides information on which foods, medicinals, eating habits and supplements will assist patients with their healing and protect their health. She recommends brands of supplements that are most easily absorbed, talks about a plan for working new foods into the diet and answers questions about food and nutrition. Stay tuned for classes on food therapy and cooking and eating well! The fewer ingredients the better. Preservatives, additives and processed ingredients with long names are difficult for the body to digest and have other negative health impacts. The more complicated (and numerous) the ingredients, the more work your body has to do to break them down. Ingredients are listed in order of how much the product contains. This is how companies get sneaky, including sugar by several names so they can be further down on the list. In general, the top three ingredients make up most of what you are eating. If you don’t recognize the name of something, it might be a tricky way the manufacturer is covering up for inclusion of something highly processed, sugary or just bad for you. Whole, fresh foods grown in the same climate as the eater are always the best. Pesticide free and organic foods are less toxic for the body and the planet. Many prepared and preserved foods contain high amounts of sugar because it is addictive and food companies know it. Click here to read more about sugar, substitutes for it, and nine reasons to avoid it . Hormone and antibiotic-free meat! Farmers markets, local butcheries, small farms and natural food stores offer alternative meats. Americans consume more meat than they should on average, so if you can imagine eating less meat but making sure it is good quality, the price difference is not as significant. Plus, it is fresher, tastes better and generally involves better conditions for the animals. People don’t need hormones from the animals they eat to throw off their own delicate hormone balance! And this way you support farms that choose not to inject hormones and antibiotics into their animals, which inevitably get into our soil and water. Grass-fed beef and other red meat is far preferable as grain-fed animalsare often raised on GMO corn and soy, proven to cause health problems in humans. An important note: A lot of healthy, organic, free-range, local food is expensive. It doesn’t feel logical that foods involving less processing that travel a shorter distance cost more money, but it is the current reality. Fortunately, most farmers’ markets and natural food stores accept food stamps. Grains, nuts and seeds in the bulk section of the grocery store can be cheaper and small amounts can be purchased. Eating with the seasons means eating foods that are often cheaper because of their abundance. You can use the scraps of meat and veggies that cannot be eaten to make great tasting stocks and soups. Cutting back on sugary foods means buying less of the foods you don’t need to be healthy, so you can spend money on the ones you do. Still, there is no question that cooking and eating well is a privilege.